Snellville – Hypertrophic cardiomyopathy is the most common inherited cardiac disease and is present in 1 in 500 in the population. It is one of the most common causes of heart-related death under the age of 30 and can affect both men and women equally. In an effort to raise awareness about the symptoms of this disease and preventative measures and treatments that are available to patients, Dr. Marc Unterman, a cardiologist at Eastside Heart and Vascular, further, explains this condition. Hypertrophic cardiomyopathy is a disease of the heart in which there is thickening (hypertrophy) of a portion of the left ventricle of the heart out of proportion to the others. This can commonly include the muscular septum between the left and right ventricles but rarely can cause the thickening of the apex (tip) of the left ventricle. Some people who have this disease have severe symptoms and complications while others have no signs or symptoms and are not affected. The question then becomes, how do physicians diagnose this disease? “Diagnosis of hypertrophic cardiomyopathy is determined by physical exam (a murmur), ECG abnormalities, and by ultrasound of the heart, which is called an echocardiogram. While the majority of patients may never have a problem, symptomatic patients must be treated,” stated Dr. Unterman. If you would like more information on hypertrophic cardiomyopathy, other cardiovascular conditions or treatments, you can count on Dr. Marc Unterman and the experienced physicians at Eastside Heart and Vascular for all of your heart care needs. The practice will be open to see patients at their Snellville and Lawrenceville locations as well as satellite offices throughout Gwinnett and Walton County on November 1. The physicians of Eastside Heart and Vascular will include Dr. Marc I. Unterman, Dr. Marcus C. Sims, Dr. Michael A. Lipsitt, Dr. Niraj Sharma, and Dr. Demir Baykal. 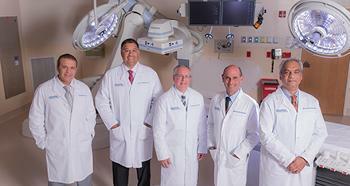 Dr. Unterman and his colleagues have assembled a team of physicians that will bring the latest expertise and techniques in cardiology to the local community.